Monoposto Racing Club has been leading the way in organising low cost single seater racing for its members for over 50 years. The Monoposto Championship is the largest single seater championship in the UK with typical entry numbers in the 50+ range. 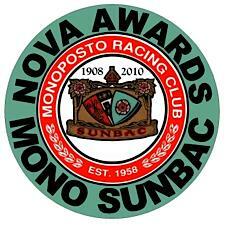 Monoposto Racing Club has combined forces with SUNBAC to run the Monoposto SUNBAC Nova Awards, which are specifically aimed at encouraging new drivers. SUNBAC – the Sutton Coldfield & North Birmingham Automobile club – has been historically important in introducing new competitors to motor sport. Although SUNBAC is no longer active in Motorsport organisation their major support for the Nova Awards means that these now offer a long-term platform to help new drivers develop their careers. Started in 2011, as part of the Monoposto Championship, the Awards have been for the first and second place drivers on Championship points won in any Mono class, who start their season as “novices”. For 2019, the award provides a free twin header Monoposto Race entry in the following season for the winner, and trophies at the Annual Awards Dinner for both the winner and the runner up. The Monoposto SUNBAC Nova Awards will be open to any full Monoposto member, who starts their Monoposto Championship year still needing to be observed and to obtain some or all of the initial 6 signatures on their competition licence Upgrade Card. To be eligible for the Monoposto SUNBAC Nova Awards, a competitor will therefore start their Mono Championship campaign as a novice race driver as defined by the MSA, with the car carrying the compulsory black/yellow cross. The Monoposto SUNBAC Nova Awards are a positive recognition that Monoposto is a key entry point into single seater racing in the UK, and one which also enables racers to progress to faster cars as they gain experience.